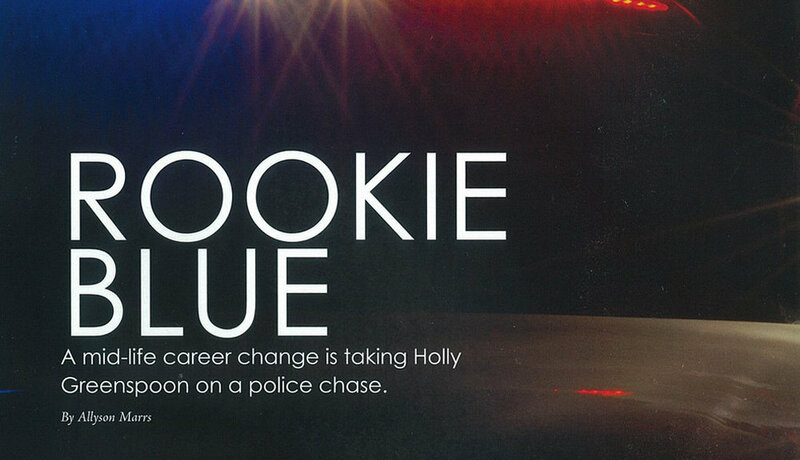 Holly’s not exactly running from the law; she’s just taking it with her. She’s ditching the briefcase for a pair of handcuffs, and turning in her business suit for a pair of police blues. At least, that’s her plan. Once a lawyer working in family law and domestic violence, Holly Greenspoon is now an aspiring police officer. A single mom with a 14-year-old son and 12-year-old daughter, she’s proof that it’s never too late to start over. “Some things may appear to be a crazy idea, but in the end, they might be the best thing,” Holly said. Before she set her sights on the force, Holly worked in politics on Capitol Hill, and then became a lawyer, where she helped victims of crimes. “It’s rewarding work,” she said. “But I came to realize I want to be out in the community—out on the front lines.” Rather than being a part of the secondary aspect of law, Holly wanted to be on the ground level, where the law interacts with the people. Holly had to start with the physical. “I was scared to death,” she said, remembering that her last similar test was back in grade school. With a 300-meter sprint, a 1.5-mile run, timed situps and pushups, she decided to enlist some help to prepare for the big day. Bellevue Club trainer Shannon Treybig threw Holly right into her biggest fear: the sprints. “I thought I was in shape already, but I was lacking, and I found out quickly!” Holly said. Together, the women worked on full-body strength training for one hour, twice a week. Shannon focused on building Holly’s upper body strength, abdominal power, running strength and endurance. Holly then continued to push herself on her own time, devoting five to six days a week to getting her body ready. During the test, it was just Holly and seven men. Although she was nervous, it didn’t show when she “beat” the guy next to her during the sprints. “It’s not a competition!” she said, “But it was nice to beat a couple men,” which she also did during the 1.5-mile run. Shannon was thrilled. “She cheers me on,” Holly said, and because of their time together, Holly has even found a new hobby: running. Holly’s now looking into running half marathons, more confident than ever. “If you work on yourself physically, it has a direct influence on your outlook on life,” she said. Now, she’s excited for the possibility of joining the force and doing what she truly loves. But the biggest thing she’s taken away from this first step is that the only person who can stop you from achieving a goal is you.